If you are the type of person who finishes all of their Christmas shopping in July, you may not need any gift ideas. However, if you still have some gifts to buy, this list may provide some inspiration. We have a list of different types of gifts that can promote a healthy smile. 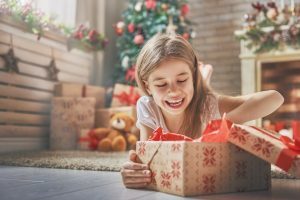 So whether you are filling up a stocking with little bits of fun, buying an impressive gift for a loved one, or treating yourself, we have some healthy-smile gift ideas for you. Be sure to check in with the dental team at Grinnell Street Dental in Sheridan, WY to make sure you end 2018 with a strong, healthy smile. It can be tempting to just fill a stocking up with candy, but travel-sized oral hygiene products can make for surprisingly fun stocking stuffers. Get some toothbrushes in fun colors, toothpaste in fun flavors, and packages of floss. Drinking water throughout the day is a great way to keep the smile rinsed and free of bacteria. A reusable water bottle is a great way to promote drinking a good, hydrating amount of water throughout the day. Buy someone a nice, new water bottle in their favorite color. Some bottles can keep water cold for a long period of time. Want to splurge on someone special? Buy them an electric toothbrush or water flosser as a nice gift. There are some very sleek options out there in varying price ranges. If you have been wanting to update your smile with a dental treatment, now is a great time to do so. You can plan a cosmetic treatment for yourself or a full-smile rehabilitation. If you want to treat someone else in your life, you can help plan a visit for them to check-in with the dentist. Are you still shopping for the holidays? Give the gift of a healthy smile this year. Schedule a consultation by calling Grinnell Street Dental in Sheridan, WY, at (307) 672-7567. We also proudly serve the residents of Gillette, Billings, Miles City, and all surrounding communities.